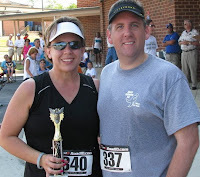 David & Andrea Osborn competed in Cordele's Watermelon Days Festival 8K on Memorial Day (5/26/08). More than 150 runners finished and this couple made the Club proud since both won age group awards. Andrea said "it was a great run and a bit of a challenge."